Written on March 28, 2013 . Posted in Announcements + Updates, Architecture and Design. 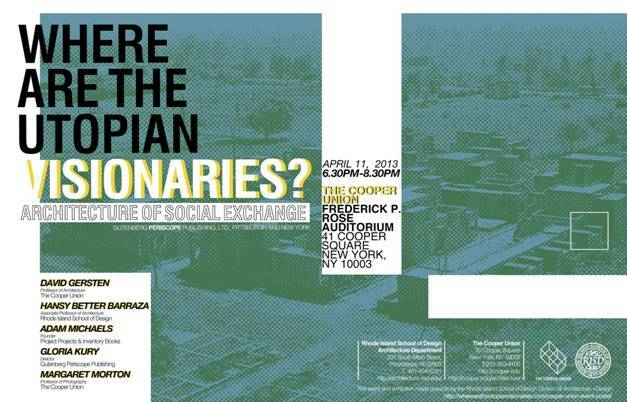 David Gersten (Lecturer, Architecture) and Hansy Better Barraza (Associate Professor, Architecture) will be participating in a panel discussion at Cooper Union. This panel discussion, drawing content from a recent publication entitled “Where are the Utopian Visionaries? Architecture of Social Exchange” edited by Hansy Better Barraza, aims to showcase the work of contemporary architects, designers, and thinkers who continue to address one of the most poignant questions of our time: what is the role of social and community building in the practice of architecture? Panelists include David Gersten, faculty at RISD and Professor of Architecture at The Cooper Union; Hansy Better Barraza, practicing architect and Associate Professor at RISD; Adam Michaels, founder of Project Projects & Inventory Books; Gloria Kury, publisher and director of Gutenberg Periscope Publishing, an independent press for art and architecture; and Margaret Morton, Photographer and Professor at The Cooper Union. Gloria Kury will introduce the speakers and the discussion will be moderated by David Gersten.